In February 2016, two teenage girls in Syria were stoned to death on charges of adultery after being found in a house with two men. The men were merely whipped for the offense. Examples of stoning are rare, but each incident tends to engender a moment of global outrage. Stoning offends our sensibilities like few other vestiges of pre-modern punitive custom. Its unequal application reveals it as one of the ugliest manifestations of misogyny — a means to exert control over women’s sexual behavior dating back to the Old Testament. It’s the nasty embodiment of senseless violence committed against women anywhere in the world. My core takeaway from “Sinners” is that its playwright, Israeli Joshua Sobol, sees stoning as some of the wicked fruit borne by patriarchy. As for how he intends to use that observation as a catalyst for dramatic action, I am still unsure — even after seeing the spirited production of the play, presented by New Repertory Theatre and the Boston Center for American Performance, now at TheatreLab@855. Nicole Ansari is outstanding as Layla, a professor of English literature in an unnamed Middle Eastern country. She is shortly to be stoned to death for committing adultery, after an informant revealed her affair with a married student. 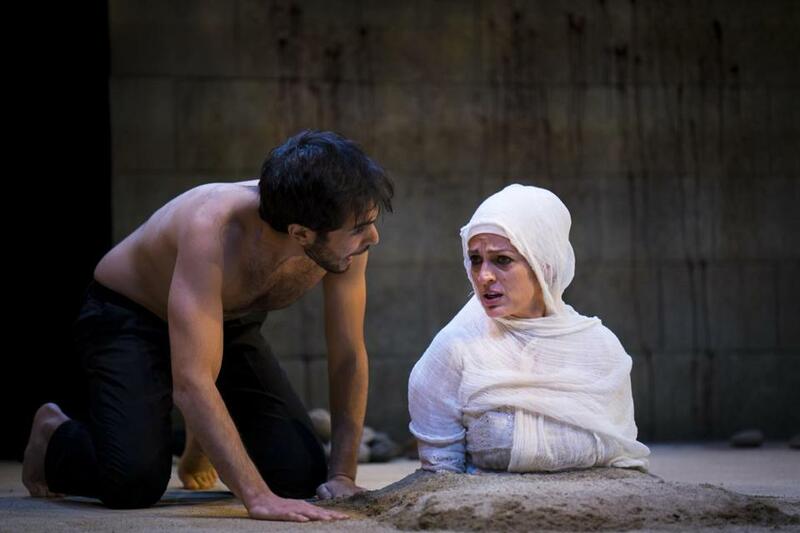 Ansari proves riveting while spending almost all of the one-act’s duration without moving her arms or legs, anchored downstage in the spot where Layla is buried in dirt up to her chest. Ray Recht’s set provides a wall upstage covered in bullet holes and blood stains, and piles of stones scattered in a semi-circle around the prone victim. Layla is by turns defiant, angry, pliant, aroused, romantic, and always full of a lusty appreciation for life. (The latter is best seen in a heartbreaking and beautiful fantasy sequence.) Ansari brings us on her character’s journey vividly. Layla’s lover, Nur (Ben Getz), is something different — whiny and numbly dependent on the privileges afforded him by his gender. Nur has been tasked with gathering and placing the stones to be used against Layla, and he seems complicit in her arrest. Their dialogue intensifies as they revisit memories of their affair and confront the present circumstances. It feels at times that the playwright is urging us to see this situation from unconsidered angles — what else would be the point of the exercise? — but the circumstances make these characters’ exchanges frequently ludicrous. Nur lacks self-awareness, and so is content to direct bitter tirades at Layla about her behavior during their relationship . . . while nearly her entire body is buried in the ground and she’s about to have her skull cracked open. With the lethal force of their society backing him up, he complains that he is the powerless one, manipulated by her predatory advances. In director Brian Cox’s program notes, he seems to tease us toward the notion that maybe both parties are partly to blame, referring opaquely to “the male/female debate” in society and suggesting that “some” people see men as the victims of women. It feels like a straw man introduced to justify an argument that is just too one-sided. Theater is an exercise in group empathy, but I have trouble discerning the gray areas we are meant to explore here. Maybe Sobol is simply calling attention to the poorly reasoned thinking, informed by unequal social status, of the sort of men who call themselves “men’s rights” activists. But if the audience remains in the same place, emotionally and intellectually, at the end of the piece as it was at the beginning, I’m not sure what was meant to happen in between. Jeremy D. Goodwin can be reached at jeremy@jeremydgoodwin.com.